In short: iteratively, and as many times as necessary before it makes sense. You owe it to yourself to understand the concepts presented here because I build on them in units 4 and 5. A good understanding of what makes Node tick will make you a better Node developer. Node with its asynchronous architecture is challenging to describe because in order to accurately describe some parts, it’s necessary to talk about other parts that haven’t yet been described. For example, to describe callbacks (we’ll get to that), I need to talk about what they’re for, and how the Event Loop (we’ll get to that, too) invokes them when it’s finished doing behind the scenes whatever you’ve asked it to do through the Node API. Event-driven, asynchronous architectures are inherently circular in nature (hence the Event Loop), as are their descriptions (the chicken and the egg come to mind). Just be patient, and most importantly: learn iteratively, and the concepts will become clear. Please allow me to make the following suggestion: to be the best Node developer you can be, work through this unit, then Units 4 and 5. Then come back to this unit and work through it again to make sure you have a strong understanding of the concepts. The ECMAScript standard (also know as ECMA-262) is currently ES2017 (short for Ecma Script 2017). Node supports ES2016, which is also called ES6, since it was the sixth version of the standard to be released. To learn more about ECMAScript check out the Wikipedia page. For example: global variables. I won’t get into the philosophical debate of “should I use global variables?” or not. You can find plenty of information on the web about that and make up your own mind. However, this doesn’t work in Node. The someNumber variable is scoped within A.js and is not visible in B.js. I’ll show you why it doesn’t work later in the course. Now let’s get back to Figure 1. The Node API is a set of built-in modules provided by Node.js out of the box for you to build your applications. Many of these modules, like the File System (fs) API, sit atop lower-level programs (the Node Core) that communicate with the underlying OS. When you use a Node API built-in module, you include it in your project by require()ing it in your code, and then invoke its functions. The Node API sits atop the Node Core, which we’ll talk about next. A CPU chip can run your program’s instructions much faster than data can be retrieved from I/O devices like disk or the network. But, without the data these I/O devices provide, your program can’t do its job. Since V8 is running in a single thread, until the data is available, everything (your program, other programs, everything running in that instance – or context – of the V8 engine) is blocked until the I/O operation is complete. Node uses libuv as the event loop implementation. To use a Node asynchronous API, you pass a callback function as an argument to that API function, and during the event loop your callback is executed. 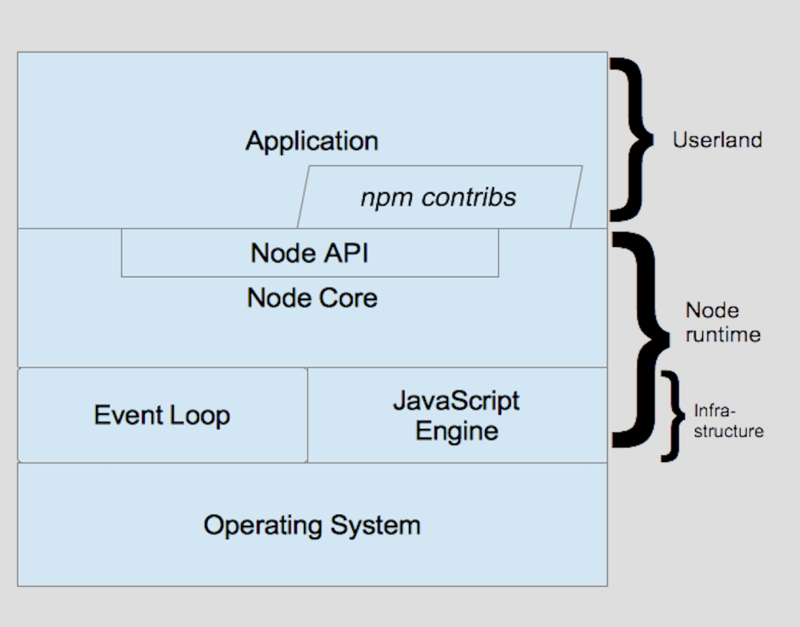 The event loop is what allows Node to provide its impressive scalability, primarily through its non-blocking I/O model. But let’s suppose the Node API provides some functionality that is not I/O-intensive but, rather, is CPU-intensive. Can the event loop help? Absolutely! libuv uses a pool of threads called the worker pool (a.k.a., the thread pool to offload both I/O and CPU-intensive tasks. Whenever V8 detects a bound Node API function call, it invokes the Node function template, which passes control to libuv, which can then offload the work to the worker pool. Again, when you make the Node API call, you pass it as a callback, and when the worker pool thread has completed the work, the Event Loop requests that V8 invoke your callback function with the results. We will look much deeper at the thread pool in Unit 5 of this learning path. npm contribs – While you can write an entire application from scratch, I don’t recommend it. Instead, you will leverage the work of thousands of your fellow developers in the Node community, whose contributions are the heart and soul of Node. As you become more expert at using Node, you will use these extensively. We’ll talk about npm (in particular the npm utility) extensively in unit 7. When you install node, you automatically get a Read-Eval-Print-Loop (REPL) environment as well. It’s not some kind of Node emulator. It is Node, just a bit more laid back, and is the perfect place to start. > let hello = "hello"
> let world = "world"
The REPL prints undefined for the first two statements (since they don’t evaluate to anything). When you type the expression hello + ' ' + world the REPL evaluates that to the String literal 'hello world'. To exit the REPL. Type .exit and press Enter. Note: When you run the .load command on example2.js, you’ll see an Apache 2.0 copyright statement that I’ve removed for space considerations from the listing above to save space. It’s time to write your first program that uses the Node API. In this case, the File System API. Exit and then start the REPL again to get a fresh Node instance. For more information about the REPL, see the REPL API documentation. We’ve looked briefly at the non-blocking I/O model and how the event loop invokes the callback you provide when it finishes whatever operation you’ve asked the Node API to perform. In this section, you write some code. I recommend you browse the source code, and run the examples in VSCode. Make sure in VSCode to File > Open on the directory that corresponds to the Unit you’re working on (Unit 3 in this case), and the examples will run just fine in VSCode. If you don’t, you’ll have to adjust the first argument to fs.readFile() in the source code accordingly. There are 51 words in this file. Again, let’s walk through the (relevant) code. Line 2: The console.log() call on the mainline shows up on the console, just as we would expect. Line 3: Ask Node to read the file synchronously, so the V8 thread (of which there is but one, remember) will be blocked until the file has been read, and the file’s contents are returned from the readFileSync() call. Lines 5-6: The console.log() statement on line 5 is executed next, followed by another on line 6. Click the Debug View on the left side of VSCode, and make sure example4.js is open and active in the editor. What’s going on? Let’s walk through example4.js from top to bottom and see. Line 3: The mainline call to fs.readFile() is made, passing the file to be read (../data/50Words.txt), the file’s encoding ('utf8'), and an anonymous callback function, which will be executed after the file has been read. Line 8: Since all code on the mainline executes from start to finish before the event loop runs, the console.log() on line 8 executes on the mainline. Lines 4-6: When the file has been read, the event poop invokes the callback, which eventually calls the console.log() on line 6. I encourage you to play around with examples 3 and 4, run them, and get a good feeling for how they’re different, and why the console output comes out differently. Synchronous I/O blocks the V8 thread until the I/O operation completes, as you saw in example 3. Why would you ever use an I/O call that blocks the V8 thread? Well, there are times when doing synchronous I/O is just fine. In fact, more often than not, synchronous I/O is faster than asynchronous I/O because of the overhead involved in setting up and using callbacks, polling the OS for I/O status, and so on. I suggest this rule of thumb: If other code needs to run in the background while your I/O operation is running, use asynchronous I/O. If not, use synchronous I/O. If you’re not sure, use asynchronous I/O. In fact, the Node design philosophy is that “an API should always be asynchronous even where it doesn’t have to be“. Use synchronous Node API calls conscientiously, and you’ll be fine. 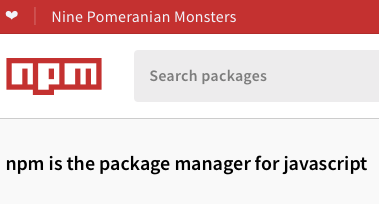 In the early Node days, npm was an acronym that stood for the Node Package Manager. It’s probably still okay to think of npm that way (although to be clear, npm is NOT an acronym), but along the way, the acronym was dropped. Not sure which modules to use in your application? Check out CloudNativeJS.io Module Insights page for more information. We will look at npm and managing your Node project’s dependencies in more detail in Units 7 and 8. In Unit 4, you dive deeper into Node’s asynchronous programming style. Take this quiz to test your Node knowledge. Answers are below. C – Doesn’t mean anything, Steve, you are just making stuff up. I/O that causes the V8 thread of execution to wait until the results are available is referred to as _ I/O. I/O that provides the Event Loop with a callback it will invoke when the I/O operation is complete is referred to as _ I/O. Blocking I/O is commonly referred to as _ I/O. Non-Blocking I/O is commonly referred to as __ I/O. Callbacks are used to support the __ programming technique. F – The event loop is what enables Node’s non-blocking I/O model, and consists of multiple phases, during which callbacks are invoked (that is, if there are any to invoke). B – The Event Loop runs only while there is something for it to do: namely, to execute any callbacks you have given it to invoke. When there are no more callbacks to invoke, it exits. Blocking – The V8 thread must wait for the I/O operation to complete, and is blocked during that time, until the results are available. Non-Blocking – By providing a callback function, the Java Script code receives the results later (asynchronously) when the I/O operation completes and the Event Loop invokes the callback function. B – Callbacks are a coding technique used to support asynchronous (non-blocking) I/O. Lines 6-7 – These lines of code are in an anonymous callback that is executed by the poll phase of the Event Loop as soon as the file has been read. Node.js Org Stay up to date on the latest from the Node community. Node API documentation Check out the extensive Node API documentation. Create a cloud-native Node.js application with Docker, Kubernetes, Helm, Prometheus, Zipkin and App Metrics.